In today's environmentally sensitive environment dust emission control is of upmost importance for both the health and safety of employees and neighbours. 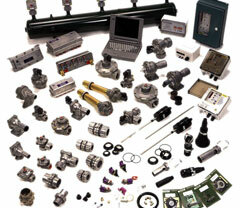 Hitemp Pneumatics can offer solutions for dust control or product collection. Goyen T Series Pulse Jet: High performance diaphragm valve with threaded ports available with integral solenoid pilot or as a remotely piloted valve in sizes from 20 mm [¾” bsp] – 75 mm [3” bsp]. Goyen DD Series Pulse Jet: Diaphragm Valve with dresser nut ports with two pilot options, and in sizes 20 mm – 45mm. Goyen FS Series Pulse Jet: Diaphragm Valve with flanged inlet port and slide seal outlet port for easy installation with two pilot options and in sizes 25 mm and 45 mm. Goyen MM Series Pulse Jet: Very high performance diaphragm valve designed to be mounted directly into the compressed air manifold with two pilot options and in sizes: 25 mm, 40 mm, 76 mm and 102 mm. Pilot Valves: Hitemp Pneumatics offer a full range of pilot valves supplied individually or as an enclosed pilot valve bank available 3-5, 3-8 and 3-12 configurations. A range of options are available for controlling the pulse time and cycle for reverse pulse collectors. Hitemp have a range of timers capable of handling up to 48 stations with push button settings for 'pulse duration' and 'off time' with digital displays. Systems for controlling the cleaning function are now offered with features such as demand cleaning, high pressure differential alarms, tube cleaner, remote stop, coil failure and low header pressure. All functions are built into one controller. Replacement - timer cards, filter bags, cages, spare part kits and solenoid coils are either stocked or readily available. 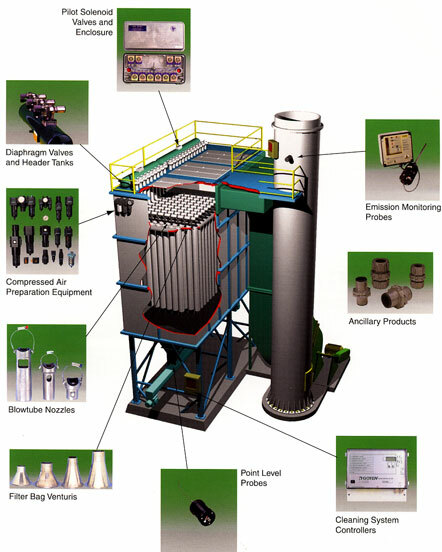 As a total system solution provider, Hitemp Pneumatics go beyond just supplying a reverse pulse filter house by also offering a large range of components to ensure cost effective and reliable cleaning system design, installation and operation within a reverse pulse filter. Within a reverse pulse filter the overall cleaning efficiency and long term performance of the bags or cartridges are critically dependent upon the control of the cleaning air into the individual filter bag or cartridge. Goyen products are produced to exacting tolerances and quality standards to ensure their effectiveness within any reverse pulse filter.